Fracking will go ahead in the UK despite objections after ministers overruled a local government ban on the controversial drilling method. The landmark ruling for Britain’s budding shale gas industry steamrolled over a decision by Lancashire County Council to block fracking at the Preston New Road site in Little Plumpton, Lancashire. Fracking is a controversial energy extraction method in which liquid is pumped beneath the Earth’s surface at high speed to break apart rock and free trapped natural gas. The government wants Britain to be home to a major shale gas industry, but anti-fracking campaigners warn the technique causes water pollution, earthquakes and contributes to greenhouse gas emissions. “Shale gas has the potential to power economic growth, support 64,000 jobs, and provide a new domestic energy source, making us less reliant on imports,” said Javid. Cuadrilla Chief Executive Frances Egan welcomed the decision. “We have been through an exhaustive environmental impact assessment on this,” she said. “This is a total denial of democracy. Our parish council, our borough council, our county council all threw out this application,” the group’s co-founder, Pam Foster, said. Greenpeace condemned the decision, which it claims will throw Britain’s climate change commitments into question. “This fudged decision shows the government is struggling to force fracking on a reluctant nation. 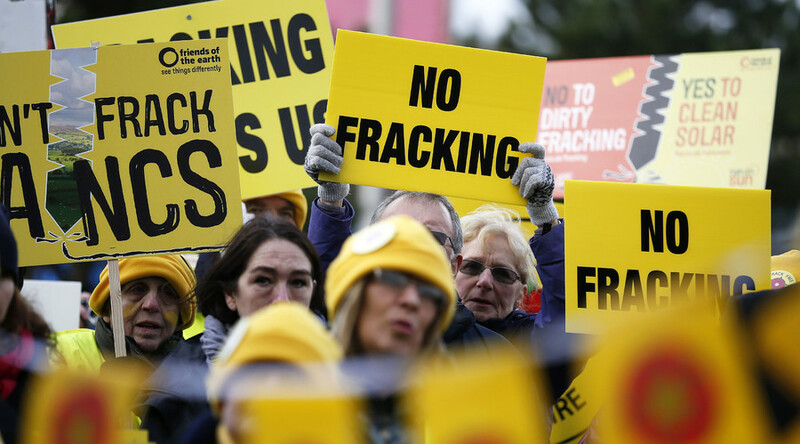 Fracking will put our countryside and air quality at risk,” said Greenpeace campaigner Hannah Martin.